At St. Richard’s we understand that the Internet is a fantastic place for researching and socialising. Whilst we encourage our pupils to use the Internet, we are also aware that there are potential online dangers which may affect our pupils. We want to support the children and our parents in keeping safe by offering information and support on the wide range of online safety issues that might affect the whole family. As a school we are currently working towards the E Safety Mark. As part of this process we are required to use the 360 Degree Safe tool to guide our progress. 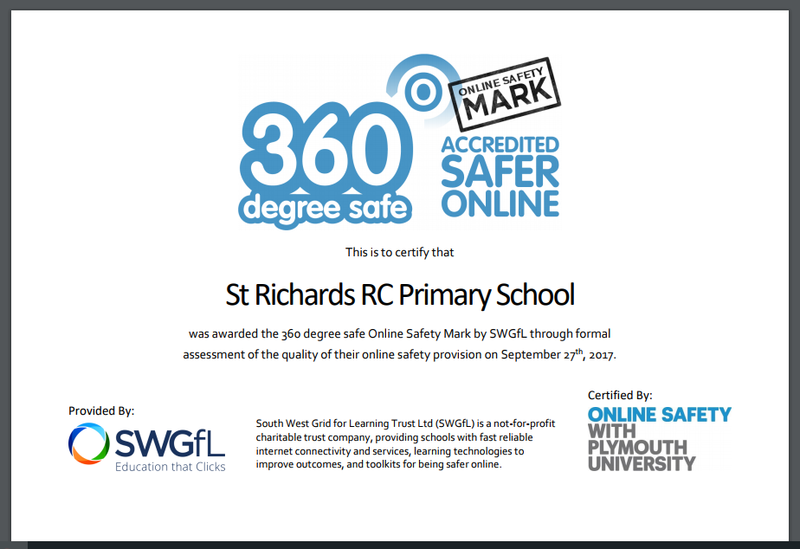 This process demonstrates our commitment to online safety as a part of our curriculum. What is our personal information? Who are our online friends? Who can view your images? How do you behave online? This academic year we have established an Online Safety Group consisting of Year 6 pupils. They are committed to raising awareness about online safety and providing support for their peers. The online safety group meet termly to discuss ideas and issues.